WASHINGTON — Nearly one in five Americans incorrectly say President Obama is a Muslim, up from 11% last year, according to a Pew Research Center poll released today. In the survey, about one-third of Americans correctly say Obama is a Christian, down from 48% who said so last year. In all, 43% say they do not know what religion Obama practices. The survey "shows a general uncertainty and confusion about the president's religion," said Alan Cooperman, associate director of research with the Pew Forum on Religion & Public Life. The survey of 3,003 adults was taken July 21-Aug. 5, before Obama endorsed a Muslim group's right to build a mosque and Islamic cultural center near the site of the 9/11 attacks in New York City. Those comments, made last weekend, added to the firestorm over the location of the mosque. On Wednesday, Obama said at an event in Ohio that he has "no regrets" about his comments. Responses in the poll tended to fall along ideological lines, Pew found. About one-third of self-described conservative Republicans said they believe Obama is a Muslim. "Those who say he is a Muslim overwhelmingly disapprove of his job performance, while a majority of those who think he is a Christian approve of the job Obama is doing," said a Pew report about the poll. 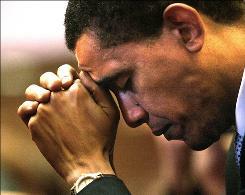 Pew found that "even among many of his supporters and allies, less than half now say Obama is a Christian." Obama has spoken frequently about his Christian faith, including at the annual National Prayer Breakfasts and at a White House event celebrating Easter this year with Christian leaders. He receives a daily devotional prayer sent to his BlackBerry device. As a candidate, Obama participated in a forum led by prominent Christian pastor Rick Warren, in which he said his "starting point" is "Jesus Christ died for my sins, and that I am redeemed through him." Cooperman said one possible reason for confusion over Obama's religion is that people may not perceive the president as being as forthcoming about the subject compared with President George W. Bush. The Pew survey, however, showed that 48% say Obama relies on his religious beliefs the "right amount" when making policy decisions, compared with 53% for Bush. The reason this story was picked is because for the simple fact everybody and their momma knows the President is a Christian. I mean seriously what was all the controversy surround Rev. Wright about if you didn't believe the man was a Christian and that his pastor was his chief spiritual adviser. I'm so sick of these made up stories that people are trying to get to stick to this man in order to de-legitimize him as the Commander-in-Chief. And for the record, if he was a Muslim who gives a damn? What does him being a Muslim have to do with his policy? How did being a Christian help George W. Bush? If anything he made Christians look bad. Do you agree or disagree with Today's Dumb Media Story Award'? Please share your responses in the comment section.